Tilly Farmer almost has everything she’s ever wanted. Married to her high school sweetheart and loving her career as a guidance counsellor at the same high school they met at, the only thing missing was a baby. On the day of the school fair, she finds herself in the psychic tent, where an old friend, now a psychic, gives Tilly the gift of clarity. She begins having spells that predict the future – her father drunk again after years of sobriety, her husband packing a u-haul truck - and she panics as they start to become a reality, forcing her to question whether she had really been all that clear about her perfect life in the first place. The One That I Want was an emotionally charged read that kept me up late tearing through the final pages. Funny and insightful, this tale of having all you’ve ever wanted and questioning the path not taken, was full of insights on love, marriage, relationships in all it’s forms and growth that can sometimes tear us apart. Women’s fiction with a deeper emotional tone and a paranormal aspect, this novel was heavier than lighter chick lit fare. The One That I Want had a strong supporting cast of characters, each one well developed and memorable and contributed to Tilly’s growth, acting as a catalyst or assisting her along the way. I enjoyed watching Tilly’s transformation and seeing her relationships develop with her sisters and her friends. The story moved along seamlessly and although her visions become predictable, the ending definitely wasn’t. The clarity Tilly was given was an interesting twist. What would you do if we were given the ability to see your future? I’m sure we all have something we wished we could have foreseen, but I’m not convinced it was absolutely necessary for the novel. Maybe I’m just envious at not having that power myself several times over, but thought the novel might have packed a bit more of a punch if she had been able to figure it out for herself. I found Winn-Scotch’s writing drew me right into the story, made me nostalgic for high school in a few short strokes and portrayed the small town setting so well that I was able to relate to it, from the parading football stars to the small town gossip, none of which I have ever experienced. Having been the first Winn Scotch novel I read, she’s now on my must read list when I’m looking for chick lit with a heavier tone. 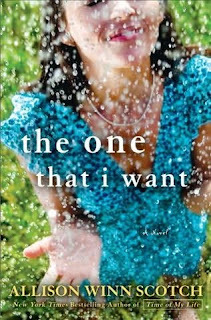 A tale of chick lit for certain this novel travels from couple to single instead of the reverse. I found myself laughing a lot at the beginning (and throughout actually) simply because Tilly Farmer is such a positive person that her giddiness made me giggle. Tilly realizes soon enough that the perfect life she’s built is not quite so solid but I still found her positive and uplifting despite the pain of her family life and her own marriage ending. I think that the novel worked because Allison Winn Scotch has the ability to build an entire history for her character. We are given Tilly’s complete story from childhood to present and from the description of her town and her highschool (that she still works in) we are aware that Tilly is very proud of her life. Also, despite her family being a source of trial and burden for her, you can see that their family unit cares deeply for each other and her friends are also key in the life that she has built for herself. The life she thought she wanted was perfect. There was so much resting in her belief that these were all the things she needed that it was hard to see it come crumbling down around her. I found the introduction of Tilly’s visions a little strange at first but soon came to accept them as part of the process- I kept thinking though that although they were useful for the storyline they would also have probably been useful serving the public perhaps and it irked me a bit. If someone could actually foresee the future or pinpoint someone’s location from looking at a photograph it would be invaluable. But hey- it’s a story so I had to let that go!